New figureheads arrive at the Fed every so often. When they do, they inherit all of the policy decisions that were made before them. Imagine suddenly waking up behind the wheel of a semi loaded with nitroglycerine, driving 150MPH, on a frozen water-slicked sheet of ice a mile deep, through a tunnel made of rings of fire, with bridge abutments every five feet to your left and right. European cohorts teetering on the brink of their own debt crises…etc. There is no right move. There is no easy solution. Understand this, position yourself outside of risk assets, and wait for the crisis that gives rise to the bailout that crushes the USD. The central bankers have used all sorts of tools. If the next crisis comes, they have nothing left. When the markets crash, their motto is: Close your eyes and let print even more money. Draghi and Yellen have perfected their image as perfect bail-out bankers in recent years: Draghi flooded Europe’s financial markets with cheap money and rescued Greece from the downward spiral with billions in aid; every time the US stock market lost more than 2% last year, someone from Yellens Fed appeared and assured the uncertain investors that the American economy was doing fine. Both used all possible tricks to boost economies and prevent the next crisis: they introduced zero interest rates, bought bonds and shares, even from private companies. Now Draghi’s ECB is still unprepared for the next crisis, as it has no funds left unless it introduces negative interest rates. Up to now Trump has followed the marching orders from his supporters, moved the American embassy to Jerusalem and reinstated the sanctions against Iran. We do not expect he will dare to disobey his overloads and let the US banks go down. 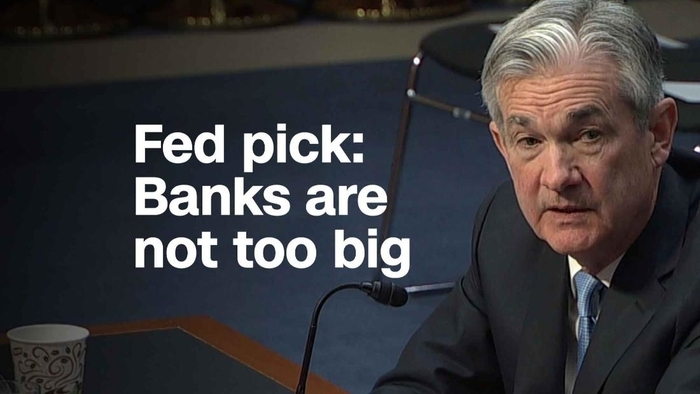 Jerome Powell can be talking tough, but when push comes to shove, he will save the American banks.